The Ragnarok, named after a cataclysmic event in Norse mythology is proud of its distinctly Scandinavian influences. From its sleek branch-like legs to its simple and minimalistic tapered top, the Ragnarok exemplifies the beauty of mixing the natural with modern, and there is so much more than what meets the eye. The elegant Ragnarok Dining Table features a solid FSC-Certified ash wood base, and an engineered wood top, finished in a white powder coating, which is heat-cured to eliminate toxins, protect against the elements, and is resistant to scratches, burns & stains. Great table--good quality. Looks Stunning! I love this table. In the first two days of having it was hit pretty hard by another piece of furniture being moved, not a mark on it. I am sure if I'd had a wooden top table it would have been severely scarred. It is very heavy and great quality. Also, looks great--clean and simple. The legs on the table are a light ash, not walnut, as they appear in the photo. However, the variation works well with the chairs and other woods in my room. I too, thought the legs were rounded from the photo, but they are squared. I am really please with this piece and would recommend it. Also, great customer service from InMod and fast shipping. This table is gorgeous, better than I expected! It is very simple but stunning...it really wowed me when I saw it in person. Very easy to assemble and I can�€™t wait to enjoy it for many years to come. fantastic design, easy to put together, gorgeous in my dining room! Phenomenal table! style, quality, complements my dining room beautifully! All for eco-friendly furniture these days, i just moved into a new place and my plan is to furnish it with mostly eco-friendly furniture - excited at going a bit greener! gave new life to my dining room! Believe me when i tell you this table can work wonders in a setting that needs a new breath of life put in it!! 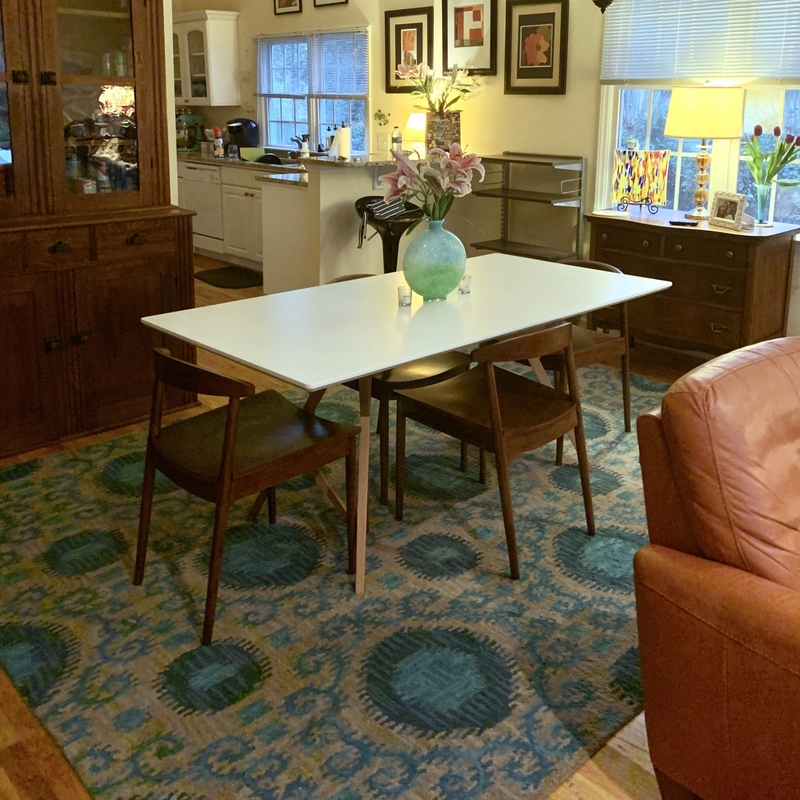 Dining room looks 1000x better after putting this gorgeous table in! Love it! In my opinion, the legs resemble an abstract tree of some sort which I really enjoy about this look especially along with my rustic contemporary theme I'm building on. Item arrived on time and customer service was informative. Thank you! Awesome!! I love my new table so much! !Thank you!! 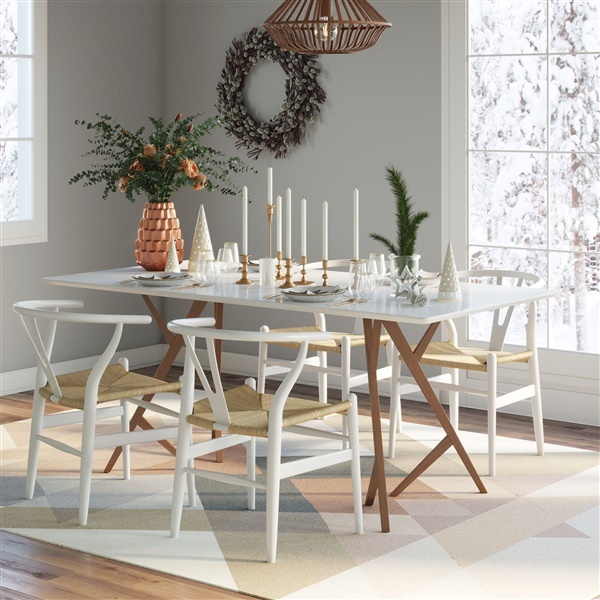 It is the exact fit for my dining room and the legs are very cool and funky looking without being over the top, it still has a sophisticated appeal to it, perfect for my taste, Excited for my dining chairs to come in so I can see them with this! The base design on this table is so unique and really eye-catching. I love that the top is scratch, burn and stain resistant. Absolutely perfect - easy to clean and very well-made! Nice quality piece of furniture. Worth the money and quite sturdy with a nice modern look. Do the legs come in different stains, i.e., walnut? 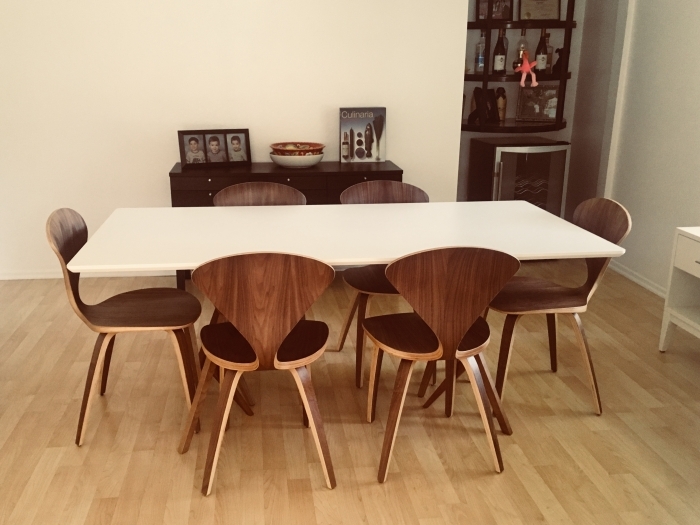 Can 6 chairs fit comfortably around the table? The legs are only available in the color as shown. The Ragnarok Dining Table can accommodate up to 6 chairs comfortably. This table is made with high quality eco materials in China. This table is made in China and you will be able to see and feel the quality on this table. At this time, we do not have this table on display in NY. The Ragnarok Dining Table weighs approximately 86 lbs.